Get a sneak peak at what’s to come in season 3 of Do you even lift, bro? Men exercising social justice! Join Jake and Carl as they kick off season 3 with a discussion about Transmasculinities. Patrice Palmer (tHEy/hYm/sHE), and D-L Stewart (he/they), Professor and Co-Coordinator of Student Affairs in Higher Education, School of Education, lead the discussion to talk about what they’ve learned through their life, wrestling with gender, race, and sexuality. What does it mean to queer gender? What does it mean to queer masculinity? The four of them get deep into breaking down social understandings of gender, race, and sexuality and actively defining and redefining themselves in the process of exercising social justice. Join Jake and Carl as they dig into the nuances of how activism looks like for men in social justice. They are joined by Kristy Kumar, Assistant Director of Educational Programs at the Women and Gender Advocacy Center. Kristy gives incredible insight around defining and philosophizing around what activism even means. Can men even identify as activist in the context of social justice? Find out, because figuring out what activism looks like for men is a struggle in exercising social justice. Join Jake and Carl as they try to figure out what the hell men who identify as “involuntary celibate” or incel are thinking. Recent news in Toronto of men’s violence against women has brought the radicalization of white cis-men, and particularly the online community that calls themselves incel. They dig into the problematic thought processes that we need to resist and take action against. And they demonstrate this through self reflection and how they used to think the same way. And finally, this is the final episode for Jake to be on the podcast. Hear what he has to say about his journey through masculinity as he prepared to graduate and continue his path of exercising social justice. Join Peter and Carl as they try to break down some of the intricacies of music consumption. Why do we only think of Black entertainers as problematic musicians? Peter is the expert, and so listening to people who are experts in their field is an exercise of social justice. Join Peter and Carl as they talk about the subtle behaviors that add up to the everyday struggle of marginalized people, especially how it relates to gender. Is saying “you guys” to a mixed gender group really that big of a deal? 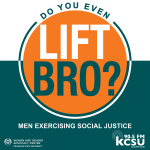 Find out as Peter and Carl give examples of how men can exercise social justice nearly every second of our waking lives. What is a “cheat day”? Peter and Carl take a break from the heavy lifting of social justice and rant about stuff. Taking breaks helps us sustain exercising social justice for a long time. Join Peter and Carl as they circle back to a conversation about humor. How does humor function in our world? As it turns out, in many, many different ways. Humor can function as a way to maintain oppression, as well as provide relief from it. Find out about the ways in which humor can and can’t be used to exercise social justice.